December is a really big month on my calendar at home. Not only is it my birthday, it's my mum's birthday the day after, and then Christmas the following week! Phew! But with so much to celebrate, it does always make December feel like a special month for me. So, this December, as I won't be at home for any of these celebrations, we decided to throw some fake parties. We don't want to miss out on all of the festive spirit! Especially as I'll probably be spending Christmas day in flip flops! Last week, I shared our Fake Christmas. 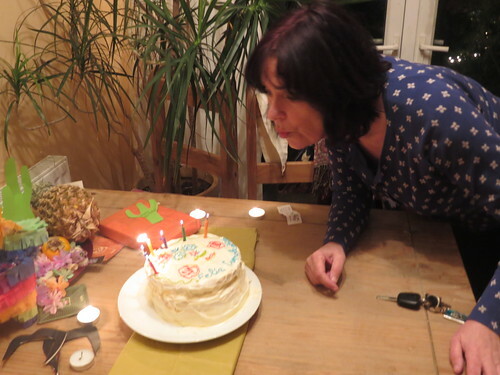 Next up on the party calendar was a little surprise birthday party that I decided to throw for my mum. 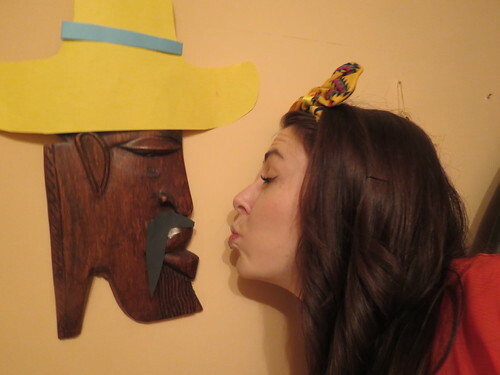 As I'll be in South America instead, I decided to go for a spanish themed fiesta! Well, it was more based on Mexico. Lots of planning went into this, although I didn't get as much time as I would have liked. 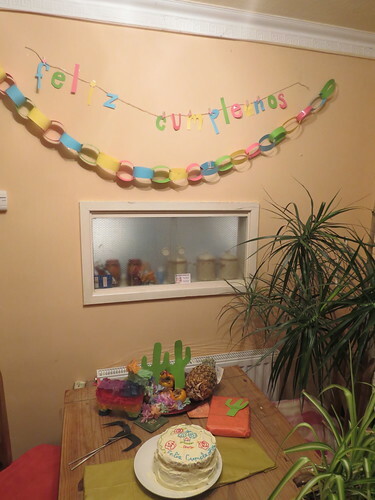 You can see my Mexican party pinboard here. As I had been so busy, I ended up with 3 hours to prepare EVERYTHING! 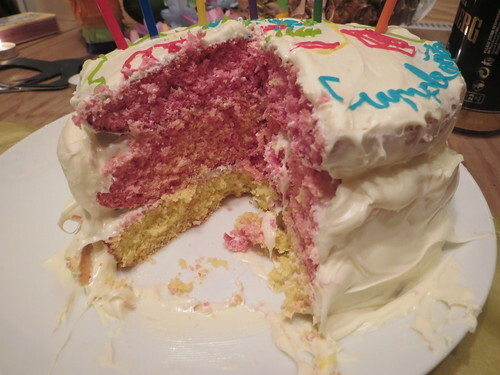 I made a 3 layered cake, which I dabbled with food colouring to try and make the layers different colours. It kind of worked! 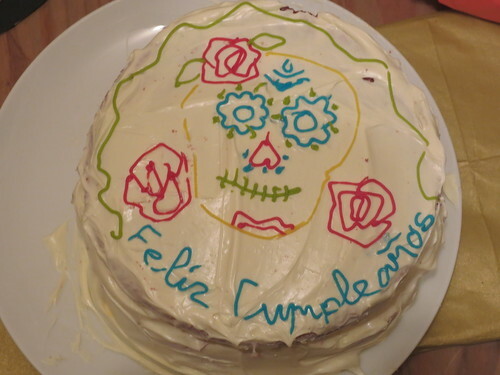 I covered this in a cream cheese icing and topped it off with a sugar skull picture with icing pens. As is sadly always the case, I went a bit OTT with the icing pens, but never mind! It was still delicious! 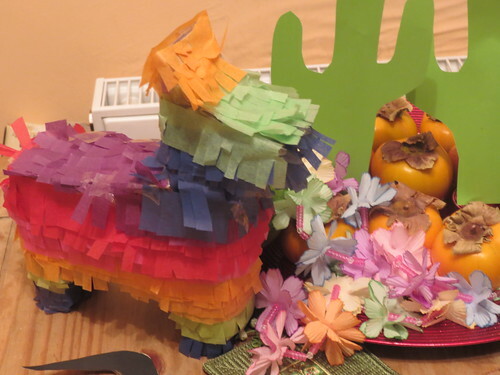 Next was my handmade piñata. I'd spotted one of these in telco for £8, and in hindsight, I probably should have bought this! 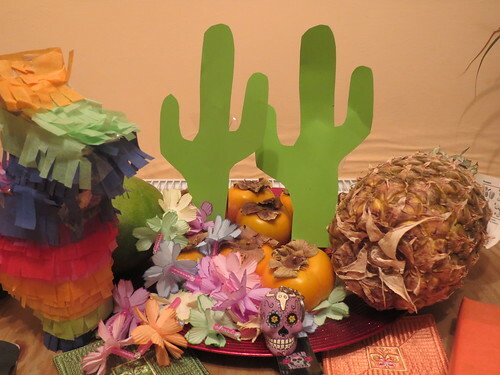 I used this how to and made my own using a cereal box and tissue paper. 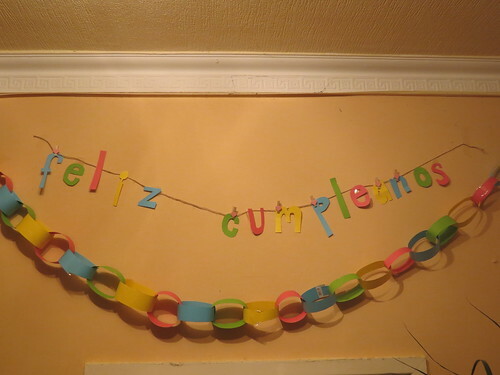 Following that were the paper garlands and banner which I had to explain to my mum means 'Happy Birthday' in Spanish. 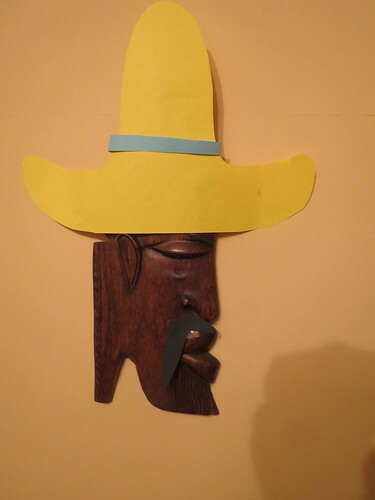 In a last ditch attempt to make the place feel a little more Mexican, I decorated my mum's African Wooden mask with a sombrero and popped some Mexican music on! 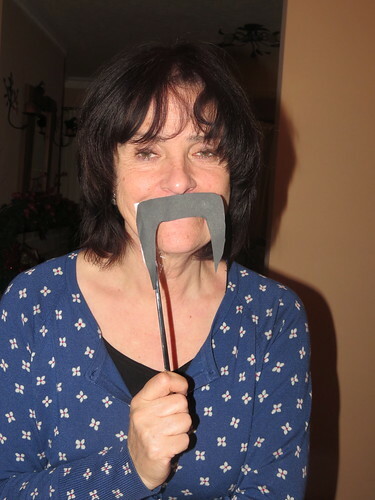 To say how little time I had, I was pretty impressed with how it looked, and so was my mum! 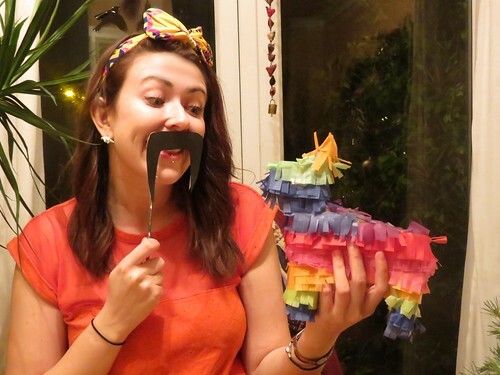 It made me realise how fun a Mexican theme would be if you did it properly! Definitely an excuse for more parties when we get back! Now, enough partying and back to the preparations. I'm flying today! Weee!